My friends, there's been a lack of gaming updates on my blog. The sole reason is Grand Theft Auto 4. I started playing it right after I finished Prince of Persia last month, and I'm still tackling it. I'm aiming for 100% game completion (a paramount achievement if I can do it), and if you're familiar with GTA games, then you'll know how crazy this undertaking is. Well, I'm almost there! Anyhow, Metal Slug Anthology. 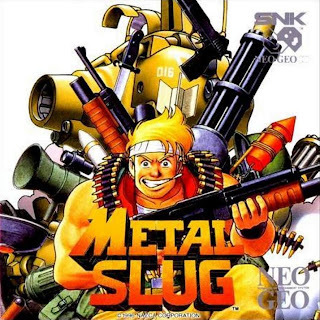 This game is a collection of SNK's Metal Slug series which includes the first six numbered games plus Metal Slug X. If you enjoy old school side-scrolling shooter games (like Contra) then surely you will love Metal Slug. It has a distinctly unique uber-violent cartoon style, chock full of blood and guts. Throughout the series, you get to fight an eclectic mix of bad guys including soldiers, zombies, mummies and aliens. The first few games focuses more on fighting a faux-Nazi-type army led by a Hitler-like dictator. As you progress through the series, the style begins to bend more to the sci-fi theme more than the war theme. If you're looking for a challenging side-scroller, then MSA might not be what you're looking for. The game is simply too easy by the fact that you're offered unlimited continues. You can play as recklessly as you want and it's no better than playing carefully. Also the gameplay suffers repetitiveness, so its probably best to leave gaps of time between each game (instead of finishing one per night, eep). If you have a friend with the game, the PSP version allows you to connect with the ad-hoc to play co-operatively which can be fun. It's too bad there's no integrated wireless network to allow you to play with people worldwide. I can't really recommend a 'buy' here, unless you really love Metal Slug. But if you should choose to buy it, I say wait until you can find a used copy for $20.